Deploying overseas or outside of the continental United States (OCONUS) is part of the job in the Navy and Marine Corps. If you are permanently assigned to a duty station in a foreign country as a member of the Navy or Marine Corps team, you are eligible for the Navy and Marine Corps Overseas Service Ribbon. This is not the same as deploying overseas on a ship. However, if your duty station is on board a ship that is permanently based in an overseas port, you will also be eligible for the Navy Sea Service Deployment Ribbon. The United States Department of the Defense and the Department of the Navy present military awards to members of the United States Navy and the U.S. Marine Corps under the authority of the Secretary of the Navy. These kinds of military decorations can also be awarded to members of other military branches, so long as they are performing duty under Navy or Marine Corps command. The Navy and Marine Corps Overseas Service Ribbon is a small, 1⅜-inch-wide rectangular pin awarded by commanding officers. This ribbon has a thick, red stripe in the middle, moving outward in pairs of stripes: yellow, ultramarine blue, yellow, and light blue. There are dozens of ribbons in this particular style, but the colors and widths of the stripes are what differentiate them. Some ribbons have just three stripes; others have up to 15. United States military medals and ribbons must be worn properly on chests, lapels, and collars of clothing. Traditionally, the Navy and Marine Corps Overseas Service Ribbon is worn between the Army Service Ribbon and the Army Reserve Components Overseas Training Ribbon. A 3/16-inch bronze star will denote subsequent awards. Authorized in 1986, the Navy and Marine Corps Overseas Service Ribbon is awarded to any member of the Navy or Marine Corps upon the completion of one year of consecutive or accumulated duty at an overseas shore base duty station. For inactive members in the reserves, the award is authorized after 30 consecutive days or 45 collective days of overseas active duty for training, annual training, or temporary additional duty at overseas duty stations, deployed units, and units homeported overseas. Overseas, domiciled inactive reservists must complete 30 consecutive days of annual training or inactive duty training, or a combination of 45 accumulated days of annual training or inactive duty training in a billet with an Overseas Naval Reserve Unit or as a member of the Overseas Peacetime (Contributory) Support Program. “Active duty” constitutes a period of more than 90 days. The term “overseas” is defined as duty performed outside of the 50 United States. However, service in Adak, Alaska, qualifies military members for this award. Serving aboard CONUS-based, deploying ships, squadrons, units, or with the FMF (regular or reserve) does not qualify an individual for the award. Travel time and weekend training do not count toward eligibility. The Navy and Marine Corps Overseas Service Ribbon can be awarded posthumously, and the process is handled on a case-by-case basis. Additional service tours overseas are denoted by bronze stars for each individual overseas tour. 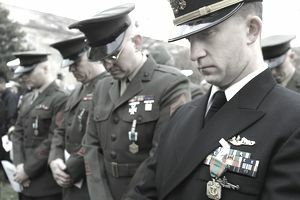 A silver star is worn with the ribbon in lieu of five bronze stars. Up until 1999, service members could not receive the Overseas Service Ribbon and the Sea Service Deployment Ribbon for the same amount of time. But after 1999, the Chief of Naval Operations allowed service members to receive both ribbons for the same tour of duty. The Navy and Marine Corps Overseas Service Ribbon was made retroactive to August 15, 1974. Anyone in the Navy or Marine Corps who had qualifying service performed between August 15, 1974, and January 1, 1979, may be credited toward the initial award of the ribbon. For active duty personnel, no more than 14 days may be waived. For inactive reservists, there is no waiver. Living overseas for a tour is what many people who join sign up for. World travel is one of the many perks of joining the military and depending on what branch of service you choose, you can live is some of the most beautiful and culturally diverse places in the world. Learning a foreign language, making new friends with the locals, and experiencing a different culture is a priceless experience that you get paid for when in the military. How Do You Earn the Army Service Ribbon?